So, finally, I can say that I have seen Paris. It was getting ridiculous, considering that I had seen the whole rest of France except the French capital itself. My parents hadn’t taken us to see Paris as kids because of the city’s notorious criminal name and due to certain things that occurred to our family members there back in the past. However, finally all this changed and I can tell you know that visiting Paris can be quite stressful but also rewarding and therefore I decided to share my tips with you on how to tackle Paris in a day! Wondering where to stay in Paris? Find the right area in Paris with the help of my blogger friend’s useful guide! Usually to see the whole french city you would require a few more days if not a week. The reason for this is the extraordinary amount of activities that one can do in Paris, especially if you have a load of money to enjoy and that’s when there are no limits to the Parisian fun. If you are rich, you can roam freely without worries. You could hire a taxi and a special local guide altogether. You could sit in the best of restaurants and enjoy the best of food. Yes, there would be no limits, but that’s reserved for people who have lots of extra funds in their bank account. For normal people like us, it’s impossible to see Paris in such a way. When you plan a trip to see Paris in a day, be aware that you will end up spending a lot more than usually for the simplest things. For example, we paid about 6 € for a beer and as a visitor, you will rarely find a tasty lunch under 8 €. We visited Paris as a group of 10 people, with our personal local family guides etc, so sometimes we would make sure that our guides could enjoy the trip by taking care of their needs as well. Therefore, we ended up spending about 300 – 400 euro at least in a day alone. Of course, we split it up amongst our family but if you consider, it’s still quite a bunch of money for a day alone! When in Paris be aware of Pickpockets and the like. We traveled conveniently with the metro (subway) and if you plan on doing the same, which I suggest, take care of thieves and don’t look for trouble, just keep to yourself, that’s the safest! As I mentioned earlier, using public transportation is the cheapest and easiest way to get around. To use the Metro or bus in Paris, you can buy the Paris Visite travel card, which you can customize to your needs. That means you can get a 1-3 zone ticket or a 1-5 zone ticket. 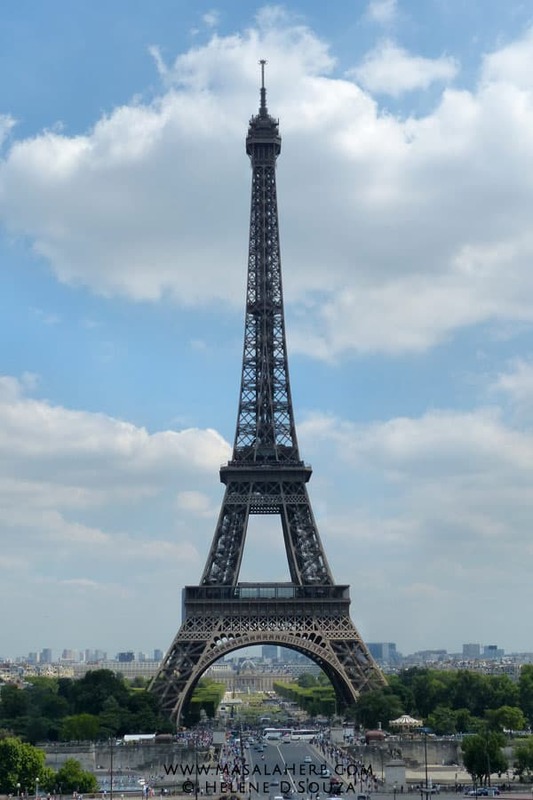 All the main sights such as the Louvre and the Eiffel tower are in zone 1-3 and if you want to visit the suburbs or if you need to reach the airports, then just get the 1-5 zone ticket. Also you may want to think of how many days you will want to use the public transport. One can choose between 1-5 days and again that’s where the price varies, starting with 10,85 € to 34,70 € with the 1-3 zone ticket per adult. For more info check out the RATP.fr page. We only used the metro to get around in Paris but you can also use the other public transport options such as the bus. Normally you can reach everything easily by metro. Here you can find the complete Paris Metro map. We also took the train first from my family’s town to Paris, so we got a train/metro ticket for the whole day, á approx. 15 € p/person. The Paris Metro can be a bit confusing at times so the best thing is to have a map with you when you are traveling. Also, you can always ask at special information counters at the station for help. I have to confess, we had to ask for help to confirm our route a few times and other Paris visitors did the same. Our journey began at the Gare de Nord (train station north) where we got out of the train and walked down the Indian/Sri Lankan city quarters, which are easily recognizable by the goods in the shops. Then we walked down towards the river Saine and the city center island, where the famous cathedral Notre Dame de Paris is situated. This cathedral has a long and exciting history and I could go on talking about it here, but I won’t, simply because I would need a separate post to do so and also because we never went inside the cathedral. I know it’s a shame but we had our reasons. You see if you want to do Paris in a day during summer time, and if you want to see more then just one building, then you will come to the same conclusion as we did once you see the long line of tourists outside the cathedral. Summertime is tourist peak season in Paris! When you are outside Notre Dame take a look at the medieval stone statues and the amazing wooden door work! 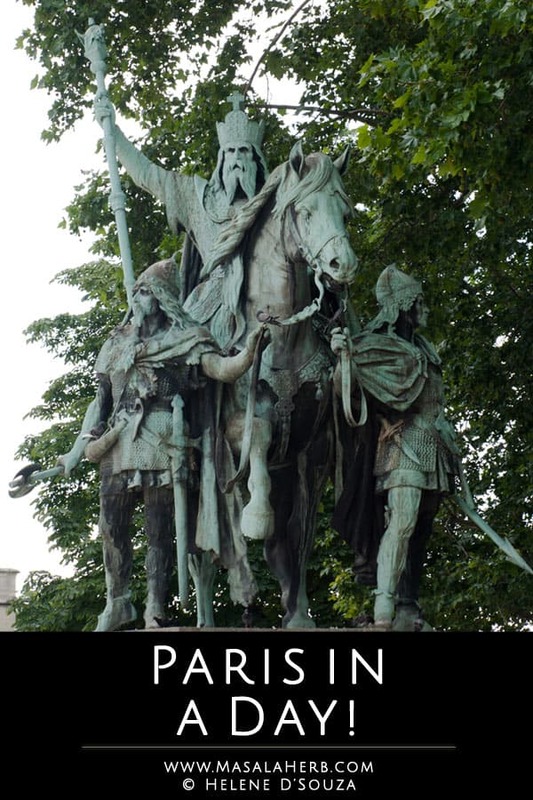 By the way the first picture of this post is a statue of the great Charlemagne, the king of franks and later the holy roman emperor, who laid out the first stones of Notre Dame de Paris. That’s the statue right next to the cathedral so you won’t be able to miss it if you visit Notre Dame. According to me the dark stone faces represent demons and the like and they definitely show the dark side of Paris. They took me back into time and satisfied my inner need to discover a part of the real Paris, or how it used to be in it’s glorious “stinking” past. We crossed the bridge and continued later towards the Louvre and the royal palace. The Louvre is one of the worlds largest museums. The glass pyramid is at the Louvre place, next to the chlorine smelling clear fountain, and the museum is all underground. It’s so vast that you would require more than a day to see all wonderful art pieces including the Mona Lisa. I decided that the next time we come to Paris, we would do the Louvre in a day! We walked towards the Tuileries Garden and took a stroll there, always walking towards the impressive Luxor Obelisk and the massive place de la concorde,where most of the guillotine executions happened during the revolution. We took a break from the 36 C. summer heat, enjoyed a cool beer, and continued to walk straight ahead towards the obelisk. Besides coming across those Eiffel tower souvenir sellers you will be also able to see from the Tuileries Garden, the real Eiffel tower on the left. It will appear as if it is close by, but it’s not, so that’s when we took the metro to the Eiffel tower station (champ des mars station). That means we entered the place de la Concorde station and took the metro train line number 8 direction Balard, got out and changed train at La Motte Picquet Grenelle to take the metro line number 6 direction Charles de Gaulle Étoile and got out at Champ de Mars/Tour Eiffel. The Eiffel tower itself is highly crowded, and we tend to avoid crowded areas so we had our fun by clicking pictures but we never went up, or we would have lost time, our mind and a whole lot of patience! 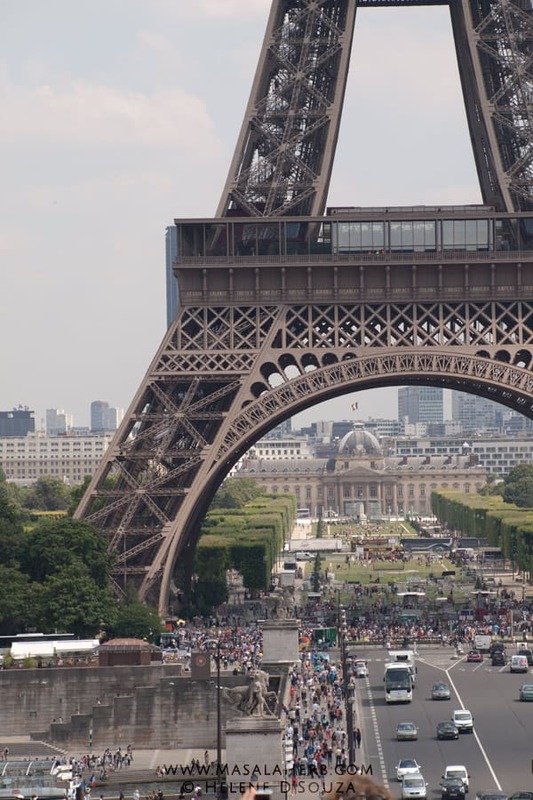 If you want to visit the Eiffel tower you might want to arrange a ticket in advance to save time. To access the first floor is free of charge, but the second and 3rd summit floors are charged for adults and children. The opening times in summer are between 9 am and 12:45 am. Right next to the Eiffel tower and the river Seine you will be able to see cruise ship docks. 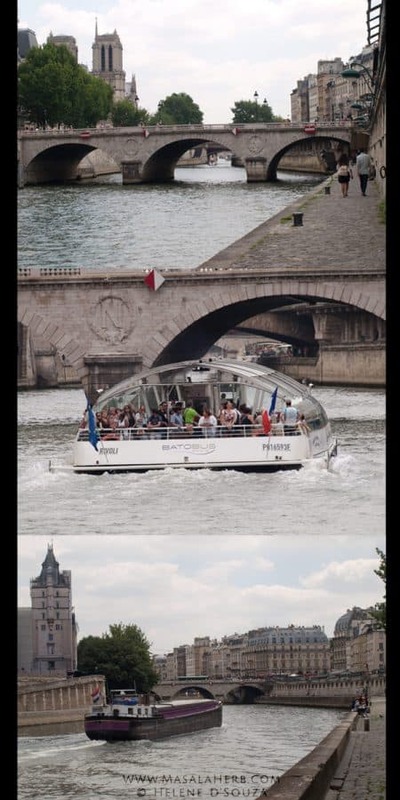 Those authentic Parisian boats are better known as bateaux – mouches. Since we wanted to relax and learn more about the Parisian sights around us, we decided to do the regular sightseeing cruise which costs about 12,50 € per adult. They also offer special lunch and dinner cruises and one can book the tickets for the bateau-mouches cruise in advance. Certain cruise ships have double-deckers and you can choose where you want to sit. At first we wanted to sit on top for the best view, however, there was no place left so we decided to sit in the ground level, which at the end was a better decision since the sun was burning down. The trip took about 70 min and the sights were explained first in French then English and at last in Spanish. Click on the link for the bateaux-mouches opening hours. Although we were already tired, we continued from the Eiffel tower towards Montmartre. We traveled again by metro, entered the Champ de Mars station at the Eiffel tower, took first the line number 6 direction Charles de Gaulle Étoile, got out and changed train at Charles de Gaulle Étoile and took the line number 2 direction Nation and got out at Blanche. Montmartre is the famous district in Paris where you will be able to come across the Moulin Rouge and all the artist boutiques. I felt the most comfortable in Montmartre, it’s just more down to earth and it’s also known as the artist’s district of Paris. We were a bit shocked at first when we got out of the metro station and walked towards the Moulin Rouge, because of the many “adult shops”. We didn’t go into the Moulin Rouge but if you want to experience a Moulin Rouge show, the prices start at 112 € per Person. 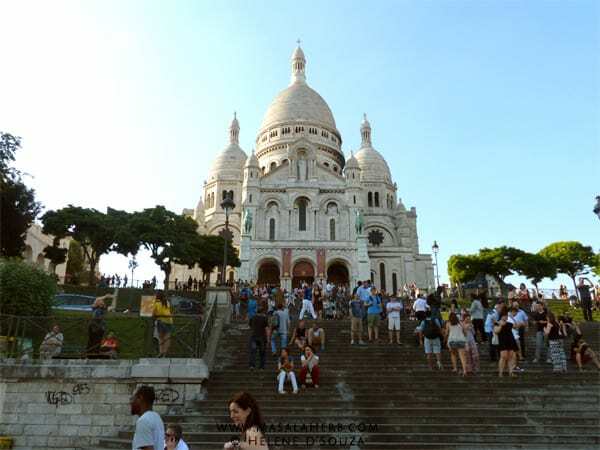 Artists organize small shows in Montmartre during summer time, especially near the Sacré-Cœur de Paris Basilica. At the end we visited the gorgeous basilica and enjoyed the magnificent view before taking a stroll back to the Gard du Nord. I want to thank our local guides, Abel Djenna Ewa and Leo for taking the time to show us Paris. We enjoyed it fully and I hope that you my dear readers will be able to enjoy it as much with this Paris in a day guide. Thanks for the virtual tour! WOW – such gorgeous photos! I so wanna go! Thanks for sharing your experience Helene. london to paris&back many years back.I think you have skipped disneyworld of paris. Wow! you covered the best of Paris in a day!! we took 3 days to do this. Absolutely lovely clicks,great read with all tiny details well explained. Oh, my. You squeeze in a LOT in one day! So glad you finally saw the city of lights…I’m ready to go back!!! I remember over 20 years ago as a college kid I went to Paris with my family. We actually did a pilgrimage to Lourdes then went to Paris. I only spent 36 hours in Paris… walked like a crazy person to hit all the highlights and take photos. Someday I want to go again… this time for a little longer. 🙂 You seemed to capture a lot in your day in Paris… it still looks like such a fantastic place to visit. One day is so short for Paris, but it’s better than nothing especially since you have been to quite a lot of places! I am impressed, but where is shopping??? 😉 I go to Paris from time to time, for short trips and I agree that pickpockets are the main danger (during the day). Moreover, they tend to aim at tourists with maps, cameras, etc… The best city map option I think is a small pocket book with lots of Paris maps by districts which can be bought in every newsagent’s (there is a small pocket size and a bigger one). I have been using it for years, many Parisians have it and it’s very convenient (and one doesn’t look like a lost tourist). I have also recently started to download city maps to my phone whenever I travel, so that I can consult it without going every time on internet too. I always buy simply a set of ten metro tickets in Paris, but I usually walk a lot, so no more than four metro trips a day… and it’s enough for a short trip. Your European holidays seem to be particularly rich this year! Beautiful pics. I went there last year with 2 of blooger good friends and we females loved it. Wow, that is a fully packed day. We’ve been to Paris about five times now and each time for about 4-6 days and it’s still not enough. 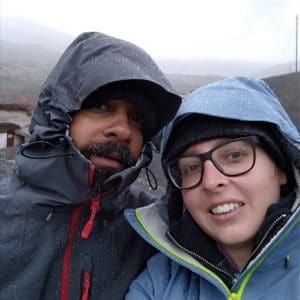 Thanks for the photos though, they bring back some wonderful memories of our trips there. Helene – what stunning photographs! While you mention the crime rate in Paris, I think like so many cities it really isn’t much to worry about so long as you take some basic precautions. Having lived in Paris for some years now I can honestly say I’ve never had a problem with pick pockets – though maybe I’ve just been lucky! I agree with what you are saying, cities are always a bit more dangerous, although I feel saver in some. I felt uncomfortable in Paris, Bombay, Delhi but I enjoyed Vienna, Zurich, Munich, Luxembourg for example. Sometimes it’s not just the pickpockets. Often you have to just take care that you don’t attract aggressive people who have nothing better to do. I know a few of my people who fell in trouble a few times in Paris. Maybe sometimes it’s just how you keep yourself, with that I mean one should not look for trouble. 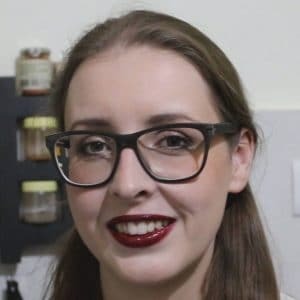 Hi, this may be interesting you: Paris in a day!